Gemini specialize in the supply of Secondary Standard Dosimetry Systems. We have designed, manufactured and commissioned a significant number of Gamma,Neutron, and X-ray Calibration Systems. As well as numerous upgrades, to both mechanical and control systems. Full control of X, Y, Z and rotational axes. Full control of rotary neutron source cassette. Certificate issued for each instrument calibrated. In-cell control of video equipment and screen grab display of camera in top corner of monitor. Radiological status supplied on monitor screen; full control of warning lights, audible alarm and e-stops. Multi zoom camera lens for clear visual image of calibration instrument. Pan/tilt unit attached to colour camera for accurate positioning. In-cell LCD mini monitor attached to trolley. Controller unit situated in control room to fully control pan/tilt, zoom and focus of camera. The function of the unit is to calibrate instruments placed onto the trolley instrument table using the radioactive sources installed in the heavily shielded exposure unit. The machine can be driven in two axes (x & z). There is a source cassette located at the bottom of the shielding for automatically selecting the different sizes of source for the source exposure mechanism. The source exposure mechanism is fail-safe and will automatically drop and return to a safe position if the power is lost or one of the safety interlocks is activated.  AI Alloy construction using channel, angle and ground plate.  Precision linear rails and bearings used on X, Y and Z axes. 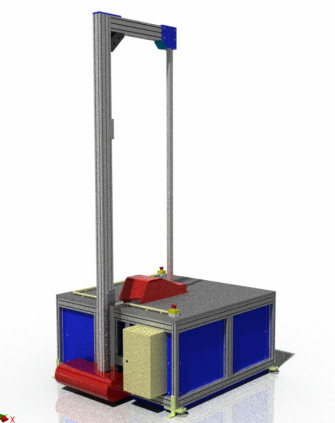  X axis driven via a linear actuator using a stepper motor/gearbox arrangement.  Y axis driven via a lead screw using a stepper motor.  Z axis raised and lowered via a screw jack using a stepper motor/gearbox arrangement.  The rotational axis is driven via a precision rotary table.  Energy chain used on X and Y axes for tidy/stress free transportation of cables.  Lengths, widths and heights can be modified to meet the requirements of the customer. Gemini's newest Neutron Calibration Rig, recently installed.